Genesis 9:20-21 And Noah began to be an husbandman, and he planted a vineyard: 21 And he drank of the wine, and was drunken; and he was uncovered within his tent. The Bible is full of these little nuggets that show up as we read. All one has to do is to assay these nuggets to find their worth. The first sin in the Bible was connected to fruit. The first sin in the new world under the new covenant with Noah was connected with fruit. The fruit in the Garden was bad for Adam and Eve and ultimately for all mankind as a curse on man resulted. The fruit (juice) that Noah partook of was bad for him and the result was a drunken stupor and ultimately a curse on the offspring of Ham through the line of Canaan. Through the consumption of alcohol Noah's judgment was impaired and self control was gone. He wound up naked before his family. From time to time I like to be as Paul Harvey and tell a little more than I know. Types in the Bible being what they are show up time and time again at various places in the Bible. I believe God is possibly giving us one of His hints as to what He wanted Adam and Eve to leave alone. Noah's undoing was the grape. I am going to show you the possibility that the forbidden fruit in the Garden of Eden was the grape. The grape is the only fruit to my knowledge in the Bible that is forbidden to anyone. A Nazarite was forbidden to partake of the fruit of the vine in any form. Numbers 6:2-4 Speak unto the children of Israel, and say unto them, When either man or woman shall separate themselves to vow a vow of a Nazarite, to separate themselves unto the LORD: 3 He shall separate himself from wine and strong drink, and shall drink no vinegar of wine, or vinegar of strong drink, neither shall he drink any liquor of grapes, nor eat moist grapes, or dried. 4 All the days of his separation shall he eat nothing that is made of the vine tree, from the kernels even to the husk. The priests were forbidden to drink wine when in service to God: Leviticus 10:8-9 And the LORD spake unto Aaron, saying, 9 Do not drink wine nor strong drink, thou, nor thy sons with thee, when ye go into the tabernacle of the congregation, lest ye die: it shall be a statute for ever throughout your generations: Ezekiel 44:21 Neither shall any priest drink wine, when they enter into the inner court. The fruit of the vine is connected to the result of sin and the penalty of sin. The life of all flesh is in the blood according to Lev. 17:11-14. We are told that the payment of sin is the shedding of blood in Heb. 9:22. Having understanding of this let us now go to Matthew 26:27-29 And he took the cup, and gave thanks, and gave it to them, saying, Drink ye all of it; 28 For this is my blood of the new testament, which is shed for many for the remission of sins. 29 But I say unto you, I will not drink henceforth of this fruit of the vine, until that day when I drink it new with you in my Father's kingdom. John 2:1-11 And the third day there was a marriage in Cana of Galilee; and the mother of Jesus was there: 2 And both Jesus was called, and his disciples, to the marriage. 3 And when they wanted wine, the mother of Jesus saith unto him, They have no wine. 4 Jesus saith unto her, Woman, what have I to do with thee? mine hour is not yet come. 5 His mother saith unto the servants, Whatsoever he saith unto you, do it. 6 And there were set there six waterpots of stone, after the manner of the purifying of the Jews, containing two or three firkins apiece. 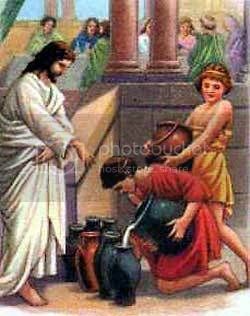 7 Jesus saith unto them, Fill the waterpots with water. And they filled them up to the brim. 8 And he saith unto them, Draw out now, and bear unto the governor of the feast. And they bare it. 9 When the ruler of the feast had tasted the water that was made wine, and knew not whence it was: (but the servants which drew the water knew;) the governor of the feast called the bridegroom, 10 And saith unto him, Every man at the beginning doth set forth good wine; and when men have well drunk, then that which is worse: but thou hast kept the good wine until now. 11 This beginning of miracles did Jesus in Cana of Galilee, and manifested forth his glory; and his disciples believed on him. Look closely at what Jesus replied to His mother. "Mine hour is not yet come" Why would Jesus say that to her in relation to providing wine? Notice pure water was placed in the container but wine was poured out. How does grape juice become wine? Answer: It corrupts! Alcohol is part of the corruption process (actually a result of the corruption process) where micro-organisms start breaking down the sugars in the mash. It is no longer the pure juice of the grape but it has taken on corruption. Left unchecked it will undergo a completion of the process and turn to vinegar and the vinegar will eventually spoil completely. The picture of the water to wine is a picture of the pure blood of Jesus taking on corruption on the cross. Man's blood is part of his physical being and as such is corrupt. When Jesus hung on the cross for us He shed His blood and paid the price for sin. Incorruption took on corruption as He was made "to be sin for us who knew no sin "(2 Cor. 5:21). Jesus body and blood took on corruption When Jesus hung on the cross His hour was come. He said in John 17:1 "--- Father, the hour is come; glorify thy Son, that thy Son also may glorify thee:"
Every thing that was undone in the Garden was remedied on Calvary. Everything present in the Garden was represented on Calvary. Man sinned and man died for that sin. Life in the blood was corrupted and the wine was it's representation until the real could be shed on Calvary. The serpent that tempted was represented by the serpent on the pole in Numbers 21:9. That serpent was destroyed by Jesus becoming his representation on the cross (John 3:14). The very resemblance of the tree that bears the grape is that of a serpent. It does not grow upright it is serpentine and it entwines. If the forbidden fruit was not a grape, it ought to have been. Written and presented by Dwight Rhodes. A llows healing for a brand new start. Letting us learn of Salvation Day. S anctified by Christ, making us whole.